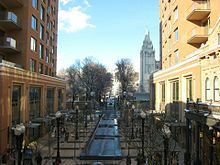 The City Creek Center is a mixed-use development with an upscale open-air shopping center, office and residential buildings, fountain, and simulated creek near Temple Square in downtown Salt Lake City, Utah, United States. It is an undertaking by Property Reserve, Inc. (the commercial real estate division of the Corporation of the President of The Church of Jesus Christ of Latter-day Saints (LDS Church) and Taubman Centers, Inc. The center integrates shopping and residential elements, with foliage-lined walkways and streams covering three blocks in the heart of downtown Salt Lake. The City Creek Center opened to the general public on March 22, 2012. This shopping, office and residential center encompass nearly 20 acres (8.1 ha) of downtown Salt Lake City. The City Creek Center is part of an estimated $5 billion sustainable design project to revitalize downtown Salt Lake City. The City Creek Center project itself has been estimated to cost around $1.5 billion. Development of the City Creek Center began in 2003, when a for-profit company owned by the LDS Church purchased the Crossroads Plaza Mall, a shopping center on the west side of Main Street from the ZCMI Center Mall. Both malls (known unofficially as the “Main Street Malls”) had been constructed in the 1970s. In 2001, the Boyer Company completed its new open-air mall called The Gateway, four blocks to the west of Crossroads and ZCMI, drawing more business away from Main Street. Soon after, the Nordstrom store at Crossroads announced its intentions to leave the mall and open a new store at Gateway. The LDS Church purchased the mall in 2003 and redeveloped the area. The church enlisted the help of Taubman Centers, Inc. to help it redesign the malls into a single project and recruit retailers to fill it. In October 2006, the concept design of City Creek Center was announced. A ribbon-cutting ceremony took place on March 22, 2012. The City Creek Center features 700,000 ft (210,000 m) of mixed use residential, office and retail space with the main mall itself featuring an open-air design, similar to the competing The Gateway mall. The City Creek Center also won an award for its retractable roof. The mall is intended to cater predominantly to pedestrian traffic. Multi-level sidewalks feature six total acres of green space, fountains, and a stream. A pedestrian skyway links the two city blocks across Main Street. The site is served by the City Center station of the TRAX light rail system, and a large underground parking lot capable of holding 5,600 vehicles. The skybridge connects the 2 upper floors of the shopping center across Main Street and acts as a pedestrian connector. The structure itself weighs 320,000 pounds and includes roof panels that can be opened, glass walls and interior benches. The skybridge itself is located directly above the City Creek Center's TRAX light rail station. The structure itself was constructed by Jacobsen construction. SWA, which provided landscape architecture and urban design services, organized the site along the city’s street-grid to keep City Creek Center integrated to the urban fabric  and took inspiration from the town’s original City Creek to create a 1.2 km waterway traversing the property as a pedestrian-oriented green space. Other elements of the landscape design support the overall concept of urban living, with pocket parks, roof gardens, and landscape connections throughout the project. Nordstrom, West Temple entrance facade at night, in downtown Salt Lake City, Utah. The City Creek Center is anchored by two national department stores: Nordstrom and Macy's. Nordstrom has a two-level, 124,000 sq ft (11,500 m2) store located on West Temple Street, across from the Calvin L. Rampton Salt Palace Convention Center and Macy’s occupies a three-level store of 150,000 sq ft (14,000 m2), located on the east block of Main Street. In the original plan, a third anchor, Dillard's, was also planned for the mall. After public outcry about the alignment of the restored, historic Regent Street area in the project, and the associated realignment, it left insufficient space for the proposed 150,000-square-foot (14,000 m2) store, plans for a Dillard's at the Center were cancelled. More room for specialty retailers and an additional condominium tower were inserted into the plan in its place. There is approximately 300,000 sq ft (28,000 m2) of additional retail space for specialty stores. A Harmons grocery store is located on the east most (3rd) block, at the corner of 100 South and 200 East streets. The northeast area containing the Key Bank Tower and adjoining Eagle Gate Tower was completed in June 2009. It contains the Food Court with a view to the west. Several eateries are conveniently located, including McCafe (McDonald's), Chang Chung, Sbarro's, Red Iguana, and Bocata. The mall has a valet-assisted underground parking located under the Key Bank Tower. Deseret Book's flagship store opened March 2010 on the northeast corner of Richards Street, in the east building of the Richards Court, directly across from Temple Square. Other first tenants of the mall include The Disney Store, Porsche Design and Cheesecake Factory plus 100 more. Several existing office buildings in the area maintain their positions in the City Creek Center development. The Key Bank Tower, however, was demolished, and its tenants relocated to the Beneficial Financial Group Tower nearby, which was renamed the Key Bank Tower. That building’s chief tenant relocated to the Gateway Tower West, which was renamed as the new Beneficial Financial Group Tower. Residents and media challenged an initial decision to demolish the old First Security Bank Building. The challenge was upheld and the building was renovated. There are approximately 300 housing units, consisting of condos and apartments, in the City Creek Center. They are located in five residential towers, one of which is 99 West. This residential skyscraper has replaced the demolished Inn at Temple Square on the northwest corner of the west block, South Temple and West Temple Streets. Richard Court located on South Temple Street, directly across from Temple Square, topped in early February 2009 with more than 45 percent sold. Construction finished for the 23-floor Regent building in 2011, located on the south side of the east block (100 South Street). The Regent was one of the last buildings completed in the City Creek Center. Other apartments are mostly built along 100 South Street, with some constructed along South Temple Street as well.The foundation, and first three floors of the 19-floor Cascade condo building was built as part of the original construction. Plans call for completion of the tower when most of the other residential units in the City Creek complex are sold, and market conditions are right. The Marriott Downtown at City Creek Hotel is the only hotel located in the City Creek Center. Prior to the City Creek development it was named the Salt Lake City Marriott Downtown. The original hotel was opened on October 15, 1981 by Marriott International and underwent a renovation when the block was redeveloped. City Creek Center has 5,600 vehicle spaces that are located on the two blocks underground City Creek Center. The parking is mixed use, serving monthly, daily and residential use. The parking is managed by Utah Property Management Associates, LLC., a sister company of City Creek Reserve Inc.
City Creek Center construction as seen from the corner of South Temple and West Temple Streets. Looking Southeast, 6 large cranes can be seen in this view (Dec 2008). Most of the City Creek Center was completed by the end of 2011 and opened in early 2012, encompassing nearly 20 acres (81,000 m2) across three blocks in the heart of downtown Salt Lake City as a revitalization effort to restore the city's downtown into a vibrant economic and cultural center. Demolition of the site’s old structures commenced in November 2006. By February 2007, the Inn at Temple Square had been completely demolished and work was underway to demolish the old parking structure for the Crossroads Plaza Mall. The destruction proceeded across the site from west to east, with several businesses remaining open until a short time before their scheduled demolition. Macy’s and Nordstrom had both closed by early February 2007. On August 18, 2007 the twenty-story Key Bank Tower was imploded and was one of the final steps to demolition completion. Demolition was completed by the end of 2007, and was followed by another six months of excavation and site preparation. By July 2008, most of the below-surface structures of the Crossroads block located to the southeast of the Main Street and South Temple Street intersection were complete. The parking structure beneath the future Nordstrom site was complete on the southwestern corner of the block. The central core of the thirty-two story condo tower, as well as the base-work for three additional residential structures located along the northern edge of the block, had begun initial construction by mid-2008. Building Envelope consultant, Morrison Hershfield provided services on issues from schematic through construction phases of the City Creek Center project. This included two underground parking garages, five residential/office buildings, multiple retail stores, one building rehabilitation, and areas around and beneath the man-made stream and fountain areas.The design of the air barrier system was developed based on a continuous air barrier membrane for all opaque wall areas tied in with the glazing and roofing/waterproofing systems. Rebar was set into place to the south of the newly relocated Key Bank Tower located on the eastern edge of the ZCMI block to the east of the Crossroads block by the end of July 2008. The remainder of the ZCMI block had just completed initial site preparation by this time with demolition of the remaining portion of the ZCMI Mall completed by January 2009. The food court section, located between Key Bank and Eagle Gate towers opened on June 10, 2009 after a 2-day delay. The first condominiums, Richard's Court, were finished during the spring of 2010. The first tenant, a Deseret Book flagship store, opened on the first floor of Richard's Court in April 2010. A number of critics opposed the sky-bridge, which was built to funnel shoppers through the development. The critics included many South-end merchants who expressed concern that the sky-bridge would divert traffic from street-level stores adjacent to the development. They state a similar result occurred thirty years ago after the construction of the two malls that City Creek replaced, during which longtime merchants such as Auerbachs, Paris Company, Wolfs, and Broadway Music all closed shop and either relocated or went out of business. Some observers felt City Creek Center was an inappropriate project for the LDS Church. They argued that the high investment in consumerism and promoting conspicuous consumption neglected religious principles, and instead suggested that funds would be better spent on community resources, welfare services, or humanitarian outreach. Others disagreed, saying the Center brought jobs and beauty to the downtown, and the LDS Church had a duty to uplift properties near Temple Square and invest its private, commercial revenues. The LDS Church has stated that no tithing money was used for construction of the complex, with the project financed through the church's commercial real-estate arm, Property Reserve, Inc. In 2008, the Sierra Club praised the church for being "good stewards" of the environment in its City Creek Center development. ^ Downtown Redevelopment Plans Announced, LDS Church press release, October 3, 2006. Retrieved 2008-04-10. ^ Carole Mikita (March 1, 2012). "A look inside as City Creek Center's completion nears". KSL.com. Retrieved 2015-06-09. ^ "City Creek Center Air Barrier". Morrison Hershfield. Retrieved 2011-03-03. ^ Jasen Lee (January 27, 2012). "$1.5B City Creek Center on schedule for March 22 opening". Deseret News. Retrieved 2015-06-09. ^ a b "Urban Infill City Creek Center". GB&D. ^ a b c d e f "Downtown Redevelopment Plans Announced". Newsroom. LDS Church. October 3, 2006. Retrieved 2015-06-09. ^ "City Creek Center Retractable Roof Wins National Architecture and Engineering Award". aisc. Archived from the original on 2015-02-20. Retrieved 2015-02-20. ^ "citycreek skybridge". Jacobsen construction. Archived from the original on 2015-02-25. ^ "Dividing Blocks and Adding Vitality to Salt Lake City". UrbanLand: the Magazine of The Urban Land Institute. Retrieved 2015-03-03. ^ "More than a Prayer: Salt Lake's City Creek Inspires Lofty Expectations". Durability and Design. Retrieved 2015-03-03. ^ Steven Oberbeck And Dawn House (February 16, 2012). "Harmons downtown Salt Lake location makes debut". Salt Lake Tribune. ^ "Shoppers paradise..." City Creek Living. Retrieved 2015-06-09. ^ "Salt Lake's former Key Bank tower will be imploded this summer". deseretnews. ^ "The Cascade | Utah Projects". www.utahprojects.info. Retrieved 2017-02-09. ^ "Salt Lake City Marriott Downtown Renamed". Press Release. Utah Business. February 14, 2012. Archived from the original on February 20, 2015. Retrieved 2015-06-09. ^ "SkyscraperPage Forum: SALT LAKE CITY - Rundown (including map)". SkyscraperPage.com. Skyscraper Source Media. July 17–27, 2008. Retrieved 2015-06-09. ^ "When Traditional Waterproofing Just Isn't Enough" (PDF). Hycrete. Retrieved 2011-03-03. ^ a b Caitlin Kelly (July 9, 2013). "Mormon-Backed Mall Breathes Life into Salt Lake City". The New York Times. Retrieved 2015-06-09. ^ Jana Riess (April 2, 2012). "The LDS Church, the Prophet Amos, and the City Creek Mall". Flunking Sainthood. Religion News Service. Archived from the original on June 23, 2015. Retrieved 2015-06-09. ^ Oman, Nate (April 2, 2012). "City Creek and the Choices of Thrift". Times and Seasons. Retrieved 2015-06-09. ^ Page, Jared (2008-06-20). "Sierra Club hails LDS Church for downtown Salt Lake makeover". Deseret News. Retrieved 2008-06-29. Wikimedia Commons has media related to City Creek Center.